Abby and Daniel created a celebration uniquely theirs with decor including origami flowers, a neon lantern reception, video games, and a dragon stuffed bouquet. 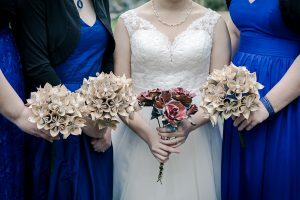 We’ve got their unique engagement story and all the insight into their fun-filled wedding. The fact their wedding day was so unique isn’t really a surprise. 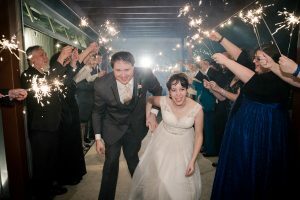 High school sweethearts who went their own ways and then found their way to each other again seven years later, their engagement began with a Pokemon ball. It seemed only natural that magic, together with their love of dragons would set the mood for their wedding day. From start to finish, they carried their theme throughout the day. 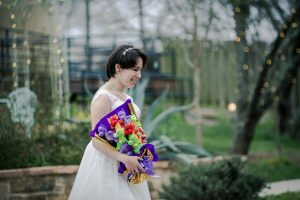 Abby carried a bouquet of dragons as a first look, her gift to her groom, while he presented her with a book of stick figure drawings of their relationship. TerrAdorna provided the perfect setting to their big day, beginning with an outdoor wedding against the beautiful Hill Country backdrop. 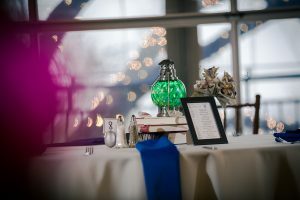 Inside, the reception filled with color. Lanterns the couple had collected through the years served as centerpieces while bridesmaids carried origami bouquets, made by family members. The cake topper and toasting goblets, both adorned with dragons, helped complete the magical theme.